The video above is a great example of “mathemagic” – magic through maths. Arthur Benjamin’s show at TED (using a mixture of mathematical tricks and savant like numerical ability) shows how numerical calculations can still produce a sense of awe and wonder. 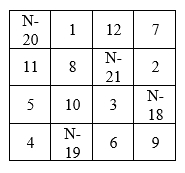 You simply need to substitute the the given value for N. If you chose to reveal the secret it would be interesting to see if students could work out how to create their own grids with different template numbers. Write a large number on the board (eg. 3143221609) and race to see who can multiply this by 11 first. The answer is 34575437699 and can be done in seconds. Simply start with the end digit (in this case 9) and write that down, then working from right to left the next digit is 0+9 = 9. The next digit is 6+0 = 6, the next digit is 1+6 = 7 etc. Each time you just add the consecutive terms of the original number. You finish by writing down the first term (in this case 3). There are loads of other tricks in the free ebook to utilise. The, “think of a number tricks,” are great for algebra topics, the magic cards make use of binary arithmetic and there is mobius magic for shape and space discussions. Jan Honnens (also on TES here) has formalised some of this content into an investigation format with some great leading questions for students to follow. And if all that isn’t enough, there’s a fantastic 96 page ebook pdf also free – available for download from here– which contains a large number of card and number tricks which make use of numerical and algebraic rules. I’d strongly recommend starting your revision of topics from Y12 – certainly if you want to target a top grade in Y13. My favourite revision site is Revision Village – which has a huge amount of great resources – questions graded by level, full video solutions, practice tests, and even exam predictions. Standard Level students and Higher Level students have their own revision areas. Have a look!